Hey, don't get mad at me! I didn't add that. Actually it's in the default style too. ...but not in this one anymore. Nuked it. Are you using the Dev layout? I see no issues with it on this one. i am now and the problem is still there. I've given it a quick check; this isn't an easy fix. I'll look into it in greater detail tomorrow. No promises, though - I'm not sure I have the ability (read: access) to fix it. 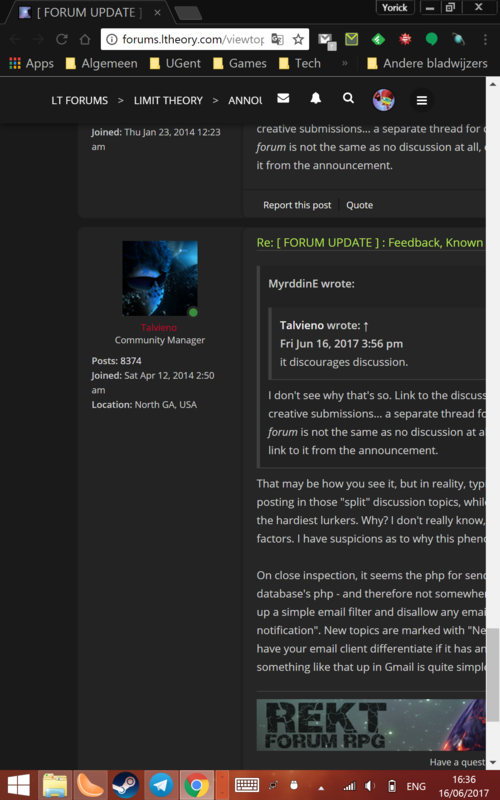 This is not really a problem with the redesign, but with the organization of the forum. I subscribed to the feed for the Announcements board so that I would get announcements (it was even suggested a few months ago as the best way to keep track of development)... I would greatly appreciate it if these posts did not allow replies, and instead a thread was created in the General forum (or wherever) to discuss the announcements. That way my newsfeed would actually just have announcements in it... not announcements and pages of discussion. While I don't use subscriptions myself, I can see how it would be annoying to get notifications for new announcements that aren't actually announcements. As long as we can talk about announcements elsewhere on the forum, I support Myrddin's request. I've done a fairly good job of keeping up with the Limit Theory RSS/Email News Thread, or so I like to think. If there's a major update of any kind, I typically post about it there, so just subscribing to that topic should work... unless you'd prefer not to be alerted about devlogs, I suppose. Talvieno wrote: I've done a fairly good job of keeping up with the Limit Theory RSS/Email News Thread, or so I like to think. If there's a major update of any kind, I typically post about it there, so just subscribing to that topic should work... unless you'd prefer not to be alerted about devlogs, I suppose. You misunderstand. Take a look at the other stickied post in the Announcement folder. Now read what it suggests you do to keep abreast of current events. Finally, actually look at what's in that feed. By allowing unlocked threads in the Announcements forum you are making the recommended method for only getting announcements not work. Host discussions in a different board; keep only Announcements in the Announcements board. No, I completely understand what you're saying. I think you misunderstand me. Let me try to explain myself a little better; I may not have done a very good job of explaining before. The recommended method for receiving announcements is subscribing to the RSS/email news feed topic, so that any new posts in that topic give you emails. As to locking all the topics in the Announcements board, that simply isn't likely to happen. Josh likes the announcements he makes to remain open to discussion - and preferably in the same board. It's the way he's done things for four years now; it isn't likely to change. Even if I moved this topic (which I really shouldn't, given how many people have already posted here), Josh would inevitably post another topic and leave that one open for comments as well. I'd like to be able to help you, though, so that's why I'm suggesting you unsubscribe from the board and subscribe to the news/devlog thread instead, if you only want to be notified of Josh's posts. Then update the other stickied post. The post you made that specifically encourages you to add the RSS feed for the announcements board (look at where that feed points, the one linked in your post), and instead explain how to get an RSS feed for a single post... I didn't even know there was such a feature in this forum software. The subscribe option I think you're talking about sends email... it doesn't create an RSS feed. Talvieno wrote: You can subscribe to this thread for future updates. This topic will remain locked but stay updated. Can I just point out that you are the first to complain about this in four years, and that everyone else (who wants to) has managed to subscribe to the specified thread without issue? I've never complained here because doing so just exacerbates the problem of spurious notifications in the announcements forum, but I've grumbled extensively in my head, particularly every time someone necroed an old announcements thread (doubly so in those long, dark, silent times). There's a strong argument in my mind for what MyrddinE is saying, and saying that no one else as complained doesn't mean it can be completely dismissed out of hand. Ultimately the forum really needs an ability to subscribe at different levels (new posts or new posts + comments), which, I assume, is outside of Tal's hands. Ultimately the forum really needs an ability to subscribe at different levels (new posts or new posts + comments), which, I assume, is outside of Tal's hands. Unfortunately so. If there was any sort of simple way, I would assuredly tackle that problem first thing... but I simply don't have the means. As it is, I'll try to look into the code and see if I can find the point where it's causing problems... but I can't make any promises. This sort of thing isn't easy to fix without the drastic measures MyrddinE has suggested: locking all topics. I wouldn't do that unless absolutely necessary, though, as it discourages discussion. I don't see why that's so. Link to the discussion thread. Organize it similarly to the monthly creative submissions... a separate thread for discussion. No discussion in the announcements forum is not the same as no discussion at all, especially if you create the initial thread and link to it from the announcement. That may be how you see it, but in reality, typically only the most frequent forum users end up posting in those "split" discussion topics, while a normal unlocked topic will often bring out even the hardiest lurkers, and tend to be much longer in length. Why? I don't really know, if I'm being honest. It could be any number of factors. I have suspicions as to why this phenomenon occurs, but it's all just speculation. On close inspection, it seems the code for sending emails is (as I should have expected) in the database's php - and therefore not somewhere I'm capable of accessing. Your best bet is to set up a simple email filter and disallow any emails from the forums with the subject "Topic reply notification". New topics are marked with "New topic notification", so you should be able to have your email service differentiate if it has any sort of filters. I typically use Gmail, and setting something like that up in Gmail is quite simple, taking all of two minutes to enact.